I have been told by several sources that Italian nouns and adjectives that originate from Latin come from accusative forms. Also the final -m is lost and an u becomes o. For example, caro > carnem > carne. However, it seems that in many cases one would arrive at the same form by taking the Latin ablative. The two cases seem to lead to equally reliable rules of thumb for guessing Italian vocabulary based on Latin. What is the evidence that the origin is in the accusative case? Judging by Latin and Italian morphology alone, the ablative looks reasonable as well. Is there some other context provided by early Italian (and late Latin) attested forms or uses? Are there illuminating examples? History of Italian is not my forte - I am not going to pretend to know Italian grammar or its history. Obviously, it takes years and decades to become an expert in such matters, so I can only summarize some relevant research I've been able to find recently. Let's wait what our Italian experts might say - I know we have them here. "The overwhelming majority of modern nouns and adjectives [in Italian - Alex B.] appear to derive from Latin accusative forms" (Martin 1995: 98; italics not mine). cf. Weiss “It is conventional to cite the accusative of all Latin noun types, except the 1st declension, as the virtual proto-form for the Romance reflexes. For 1st-declension nouns the nominative is usually cited” (p. 506). Weiss lists the following examples. Sp. quien < quem; Fr. rien < rem, cf. Italian sono < sum; Ital. notte < noctem (not nox). con tirones 'with the recruits' - ACC.PL instead of the ablative (Claudius Terentianus, first quarter of the second century; see the full text in Adams 2016, An anthology of informal Latin texts 200 BC - AD 900, Text 22). Saying that Italian noun and adjective forms are derived from Latin accusative forms is a simplification. The nominative is also a source in some cases, such as for the singular form of the noun uomo. In other cases, neither the Classical Latin nominative nor the Classical Latin accusative seems to be sufficient to explain the form of an Italian word (because of things like reanalysis of stems or nouns moving to different noun classes), although it may be the case that the Italian form corresponds to an accusative form that existed in an intermediate language variety. It does seem likely that in general/overall, the accusative forms had more of an influence on the development of the Italian forms than the ablative forms specifically, because as far as I know there is in the great majority of cases nothing particular to Latin ablative forms that helps explain the Italian forms. Phonetically, the ablative form is fairly similar to the accusative form in Latin in many situations. They are built on the same stem, and frequently differ only by the presence or absence of final m and/or the length or quality of the vowel in the last syllable; in the situations where the accusative and ablative forms are most distinct (like in the first- or third-declension plural) we don't see a reflex in Italian of the Latin ablative endings. Note also that this answer does not address the topic of changes in the use of ablative case in different stages of Latin. I'm sorry if I approach off-topicness in this post, which deals more with Italian forms really than with questions of Latin usage. There is one area mentioned below where it seems knowledge of Old Latin endings may be relevant, although I would have to do more research to confirm what Wikipedia says about this. As far as I know, just based on regular sound changes, we would expect the same reflexes in Italian for the accusative and the ablative cases in the first-declension singular (Latin /am#/ and /aː/ both go to Italian /a/; in fact, this also merges with the expected reflex of the Latin nominative ending for first-declension nouns, /a/). THe same goes for the second-declension accusative singular and ablative singular (Latin /um#/ and /oː/ both go to Italian /o/). Latin third-declension masculine or feminine nouns generally ended in -em in the accusative, which regularly developed to Italian -e due to the loss of Latin word-final "m". (Although in some words, like città < cīvitātem, this was later lost). This is identical to the expected reflex of the third-declension singular ablative ending -e.
I don't know of any sign of Latin third-declension i-stem ablative singular forms in -ī contributing to Italian, but the use of -ī vs. -e was somewhat variable even in Classical Latin. 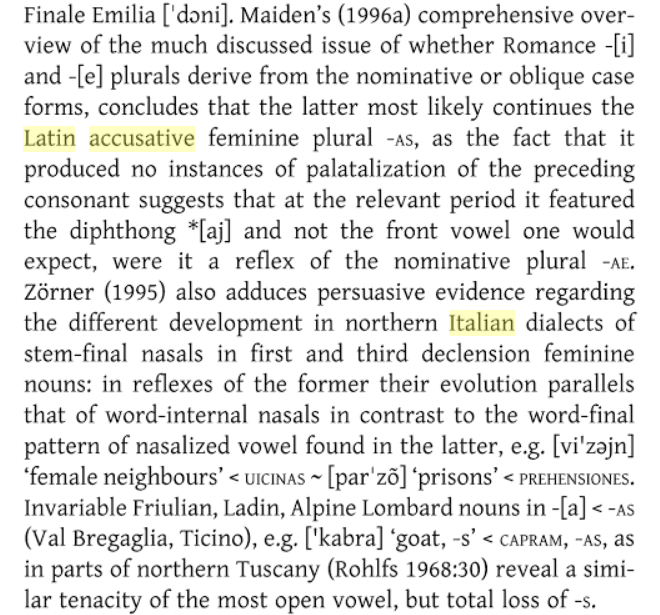 A Linguistic History of Italian (by Martin Maiden, 2013) points out that because of the loss of Latin word-final "m", words derived from the nominative/accusative form of Latin third-declension neuters that ended in -e in Latin, such as mare, came to have the same ending words derived from the accusative form of Latin third-declension masculine/feminine nouns (p. 108). This seems to have contributed to the dissolution of "neuter" as a distinct gender in Italian; I would guess that it also reinforced the use of "e" as an ending for nouns that were not a-stems or u/o-stems. The remaining third-declension neuters (which are I believe a relatively small group compared to all of the above) seem to have developed in/been taken into Italian in various ways. In some cases, we phenomena like reanalysis of stems, noun-class or gender shifts, and learned borrowings. In fact, in the development from Latin to Romance, Latin third-declension neuters seem to have often become assimilated to the conjugation pattern of third-declension masculine and feminine nouns. According to the chapter "Latin", by Nigel Vincent, in The Romance Languages, edited by Martin Harris and Nigel Vincent (2003), one such example is It. "latte", Fr. "lait", Spanish "leche" etc. which can be accounted for by reconstructing an accusative form *lacte(m) in Proto-Romance (p. 44). But Vincent points out that words like It. "cuore" and "nome" do not come from the Latin oblique stems of cor and nomen (cord- and nomin- respectively), and must be seen as derived from the Latin nominative/accusative form. Misc. examples: fiume, fiumi from Latin flumen; corpo, corpi from Latin corpus. The Italian words femore, -i; crimine, -i; inguine, -i; and onere, -i obviously cannot be from the Classical Latin nominative or accusative singular forms of femur, crimen, inguen, onus. In the comments, Draconis mentioned the fourth-declension nouns as a possible case where we would expect different reflexes for the accusative and ablative, but I actually don't know of any evidence against /o/ as the regular Italian reflex of Latin /uː/ in word-final unstressed syllables (and there seems to be some separate evidence for it: see the section below about the dialectal Italian plural ending -o that appears to come from the Latin fourth-declension nominative/accusative plural ending /uːs/). Also, we know in any case that fourth-declension nouns could be transferred to the second-declension pattern by analogy in the precursors to the Romance languages. So overall, Italian singular forms seem to give no strong indications of whether they are from the Latin accusative vs. the Latin ablative form; but sound changes are sufficient as an explanation for why the modern Italian forms are often inconclusive for determining if the form of a word comes from the Latin accusative or the Latin ablative. This means that we'd need to look at other sources of information to decide which Latin case-form was likely to have had the most influence on the origin of the singular forms of Italian nouns (substantives and adjectives). There are a limited number of singular forms like nome, fiume, cuore, corpo that are fairly obviously not derived from the Classical Latin ablative singular forms. Italian plural forms actually don't just seem to be from Latin accusative forms, but also from Latin nominative forms. (And it's sometimes difficult to tell, because there are cases like neuter nouns or third-declension nouns where the nominative and accusative forms are identical in Classical Latin). But there is stronger evidence in the plural that Italian forms are not from Classical Latin ablative forms: the only type of noun I can find where that looks at all plausible is words that were second-declension (ending in /iːs/ in the ablative plural) in Latin, and that end in -i in Italian. Wikipedia has an article "Romance plurals" (which has a disclaimer saying it needs to be better sourced, so take all of this with as many grains of salt as appropriate) that gives an overview of some theories about the origin of the Italian plural suffixes -i and -e.
It is apparently somewhat tricky to explain the exact development of the Italian plural in "-e" for feminine words that end in "-a" in the singular, but the Latin first-declension plural ablative ending /i:s/ seems to have definitely had zero influence on any Italian forms, so I would say the first-declension plural is an area where it doesn't make sense to treat the ablative case as the "origin" of Italian forms. Italian plural -e is apparently never associated with alteration of a preceding /k/ or /g/, as would be expected if it were from Latin ae, which developed fairly early on in the ancestors of the Romance languages to a monophthongal front vowel. The example given is amico, amici vs. amica, amiche. But I would say this argument is slightly weakened by the fact that there are also words in Italian that don't alter /k/ or /g/ before the masculine plural suffix /i/, presumably due to analogical leveling (like fuoco, fuochi). the change *as > *ai̯ / _# is apparently supported by words like tu stai < tū stās. But the Wikipedia article suggests that this /aːs/ may not have just been taken from the Classical Latin accusative plural ending, but might instead represent a retention in Vulgar Latin of the archaic first-declension nominative plural ending -ās. Old French, which maintained the Latin nominative-accusative distinction for a while in the form of a two-case nominative-oblique system, used the ending "-es" for both nominative feminine plurals and oblique feminine plurals. The Wikipedia article points out that this supports the idea that "Proto-Romance had nominative plural -ĀS, not *-AE" (bolding added by me, to emphasize that this is talking about forms in a language that has not yet lost the nominative-accusative distinction in general). But the evidence from French doesn't indicate how Proto-(Italo-Western? )Romance developed the form -ĀS. According to "The Italian Plural Formative -e" (Helmut Lüdtke, in Italic and Romance: Linguistic studies in honor of Ernst Pulgram, edited by Herbert J. Izzo, 1980), the Italian feminine plural article le has been proposed to come from either Latin ILLAE, ILLAS or ILLAEC (which he says was proposed by Merlo as a formation on the analogy of HAEC) (p. 122). Lüdtke argues that the *as > *ai̯ > e sound-change explanation cannot account for the existence of syntactic doubling in some Italian dialects after this article, something that usually occurs as the reflex of a former consonant cluster. As far as I can tell, his argument is that, if we start from -as and assume that the s vocalized to i̯, then [s] would no longer be present to assimilate to the following consonant to cause syntactic doubling, and if we start from -as and assume the s assimilated to the following consonant to cause syntactic doubling, then [s] would no longer be present to vocalize to i̯. He seems to argue that the existence of varieties of Italian that have both the vowel "e" in the feminine plural article, and syntactic gemination after the feminine plural article, implies that at some point it ended in -eC, where "C" is some consonant. Because of this, he argues that the vowel in the suffix must have changed before the loss of the final consonant; he assumes this vowel change was analogical (suggesting -as changed to -es under the influence of either third-declension -es, the Classical Latin nominative ending -ae, or the influence of QUAE on ILLA). I'm not sure what to think about this but in any case, Lüdtke agrees with the Wikipedia article about the ultimate source of Italian plural -e being Latin -as, although Lüdtke does describe this as an accusative form (p. 123). Interestingly, he also mentions the existence of two "marginal zones ... the northwestern corner of Tuscany ... and the Bregaglia Valley ... where we find the plural type la porta" which he says is from ILLAS PORTAS with loss of the final /s/ without a change of the vowel in the final syllable (p. 124). I can find no example of an Italian word that seems to have the reflex of the Latin third- and fourth-declension ablative plural ending -ibus (I don't even know what it would be expected to look like with Italian sound changes; my best guess is *evo *ivo). Italian words ending in -e in the singular instead take the plural ending -i, which Wikipedia indicates may have come from Latin nominative or accusative -ēs (via the sound change *es > *ei̯ / _#, followed by *ei̯ > i in unstressed syllables), or, via analogy, from the plural in -i that developed in second-declension words. Some Italian nouns that end in -o in the singular end in -a in the plural: this goes back to the Latin neuter nominative/singular plural ending. (No plural adjectives end in -a: plural nouns in -a trigger the same agreement as feminine plural nouns, so an agreeing adjective will take the suffix -e or -i). 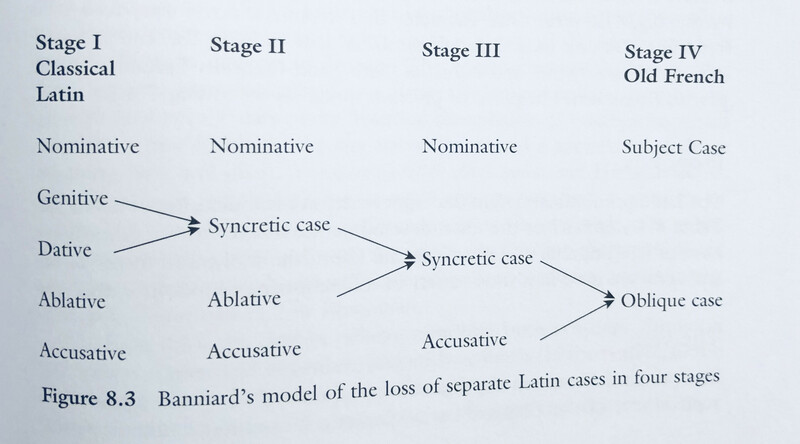 Since Latin neuter nouns always have the same form in nominative and accusative, this doesn't provide evidence one way or the other for choosing between these cases as the origin, but it does provide evidence against taking the ablative as the origin. Apparently, in dialectal forms of Italian and in some related languages, certain words descended from Latin fourth-declension nouns like fico can or could take plurals in -o; this appears to have developed from Latin -ūs, and again, while this could be either from the Latin nominative plural or accusative plural, it couldn't be from the Classical Latin ablative plural. As far as I know, we see no reflex in Italian of the distinctively formed Classical Latin plural ablative ending -(i)bus. The form of the Italian plural ending -i, corresponding to singular -o, seems consistent with a derivation from the Latin second-declension ablative plural ending -īs, but it also is consistent with a derivation from the Latin second-declension nominative masculine plural ending -ī. When the Italian plural ending -i corresponds to singular -e, a derivation from the Latin third-declension nominative/accusative masculine/feminine plural ending -ēs seems much more plausible than a derivation from any Latin ablative plural ending. The form of the common Italian feminine plural ending -e (corresponding to singular -a) seems inconsistent with derivation from any Classical Latin ablative endings. The same goes for the form of the uncommon Italian feminine plural ending -a (corresponding to singular -o). The dialectal Italian plural ending -o, corresponding to singular -o, also doesn't seem to have a form consistent with a derivation from a Classical Latin ablative ending. In my transcriptions of Latin, I am using the same IPA symbols for long and short vowels since the length marker is enough to disambiguate what phoneme I am talking about. I used the symbol "#" to represent a word boundary: "am" developed to "a" word-finally in Romance, but generally had other developments when it occured in other positions in Latin words (e.g. "amo" or "cambio"). Something like "*as > *ai̯ / _#" means "/as/ became /ai̯/ in word-final contexts". Not the answer you're looking for? Browse other questions tagged etymologia ablativus accusativus italian or ask your own question. Does a form “spiritum”, second declension neuter, exist? How should particle names ending in -on be treated in Latin? Where does “simia” come from? Where does “lascīvus” come from?